The presence of Pran Agro Ltd has brought about a significant socio-economic change in Natore. Thousands of people in Natore have found employment because of Pran Agro Ltd.
With her long black hair tightly braided, Sabina Begum could have been the legendary Bonalata Sen. Except she is not. She is a young house wife who walks to the Pran Agro Ltd's factory at Ekdala, Natore every morning to earn a living. “My husband works in the field. We have taken loan to buy a cow but we cannot pay back the instalments with our meagre earnings. That is why I have taken this job,” sighs Sabina. Sabina's work at the factory does not require any academic qualification or special skills. All she has to do is separate good mangoes from bad, cut the stem off and put them in a different basket. “I got this job on contract. If I can cut 50-60 baskets of mango a day I can even earn Tk 100-150 per day,” informs another worker Chanbhanu. The elderly woman has left her previous low-paid field-level job of collecting instalments from the members of a local cooperative. 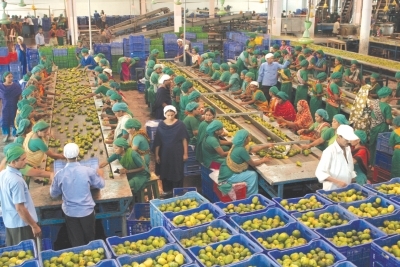 There are hundreds of workers mostly female doing the work of “Aam Bachhai” (mango selection) in the mango pulp collecting unit of Pran Agro Ltd. “We have more than 5000 contract workers working under different categories on a daily-basis, then we have 700 permanent workers and 1000 master roll workers,” informs Hasan Md Manzurul Haque, General Manger, Pran Agro Ltd. In fact, the entire activity of collecting mango pulp turns into a festivity in Natore, as soon as the mango season begins on mid- May (the beginning of the Bengali month of Jaistha when summer fruits ripen). It has brought about a significant socio-economical change in the region. 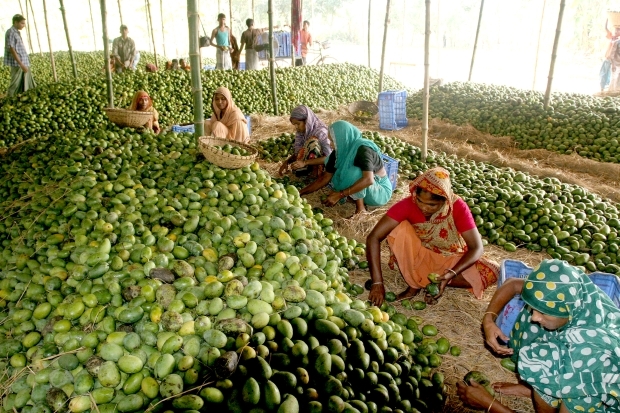 Unlike the nearby Chapainawabganj famous for its mangoes, mango growers of Natore had a difficult time selling their products especially the sour variety. “Sour mangoes grow in abundance in Natore. Beforehand, mango farmers did not get a good price for these mangoes. The mango that sold at a price of Tk 500-400 per maund (a unit of weight; one maund = 40-48 kg), we are now buying that mango from farmers at Tk 1,100 per maund,” informs Murshid Alam, a mango farmer who runs a Pran enlisted purchasing centre couple of miles from the factory. In his centre, he not only buys mangoes from the farmers in the locality but also provides training to farmers on mango farming with the help of Pran officials. He also informs that since Pran started buying mangoes directly from farmers, the role of the middleman— aarotdars (warehouse keepers)— has become redundant. “Beforehand, we had to pay the aarotdars six percent warehouse fee and Tk 12 labour charge per maund. Both the buyer and the seller of mangoes had to pay the six percent charge to the aarotdars on the agreed upon price of the mango. Now we don't have to pay any aarot fees or labour charge,” explains Murshid. “Before I had to take my goods to Bogra, Sirajganj, Dhaka, now I just need to walk to this place near my house to sell my produce. They weigh the goods here and pay me cash instantly,” informs Asgar Ali, a mango farmer, who sells his mango to Murshid. At the aarots farmers often had to leave their goods for days before the aarotdar found the right buyers, he adds. “We basically collect two types of mangoes- guti aam and ashwini,” informs Manzurul Haque. Guti aam is the local variety of mango that grows everywhere and requires no special care. “The guti aam can be of different varieties — like Mohonbhog, Bawaijhupi, Boubholano— all local names given by the kings and the subjects of that particular locality,” says Mohammad Afsar Ali, a mango supplier. Guti aam can be both sweet and sour. “We collect only the sour mangoes for pulping, as sweet mangoes have lower longevity and less preservation strength,” informs Manzurul Haque. Another mango supplier Mohammad Dulaluddin, started the business since Pran opened its factory in 2001. He needs to invest Tk 30-40 lakhs for purchasing mangoes, transportation, renting sheds and labour charges. He often borrows the money from different sources and puts in his own capital. Dulal has rented a shed near the entrance of the factory where he stocks mangoes from across North Bengal — Kansat, Bholahut, Rahampur Bagha, Arani, Ahmedpur, Natore, Baneshwar. Suppliers like Dulal, buy green mangoes from mango growers or aarotdars and ripen those at the shed. They then employ day labourers to check and separate the good mangoes from the ones that have gone bad. 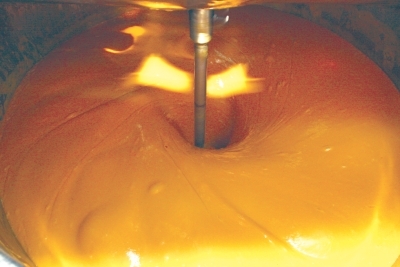 The mango pulp is refined and pasteurised in large automated machines. Chameli, a student of class-five, works at Dulal's shed with her mother Parul after school hours or during her vacation. “I stack the good ones at one place, the bad at another and the green ones at another,” she describes her job. “They pay on an hourly basis, Tk 10 per hour,” she informs. Her mother was a nurse at a local hospital. She left that job because of the low salary and night duties. “Here they pay daily and I can go home by 4 or 5 in the afternoon,” she says. The daily wages she makes is not enough, but Parul, whose husband left her for another wife, has no choice. She has to feed her old mother and daughter and make sure Chameli continues her education. The man who has envisioned this future for girls like Chameli is Major General Amjad Khan Chowdhury (Retd), Chief Executive Officer of PRAN-RFL Group. This year he has won Business Person of the Year award at Bangladesh Business Awards by DHL and The Daily Star. Born in 1940 in Natore, Amjad Khan Chowdhury graduated from Pakistan Military Academy and Australian Staff College and joined the Pakistan Army in 1965. After his retirement in 1981, he decided to start a business with a dual objective –making money and doing social welfare at the same time. “I found that our people are very poor and they need jobs. I also found that our comparative advantage, if there was one, as a nation, was in lot of water, fertile soil, sunshine throughout the year and people who took to agriculture as second nature,” he says. So he began to think how he could combine these for profit and welfare. However his beginning was not easy. “We went into production of agricultural produce like papaya, guava, banana, some fisheries, including the rajanigandha (tuberose) flower. We found that if the crops were good the price would go down,” he reminisces. Later he found the solution to this problem in agro-processing which adds value to agricultural commodities and increase their shelf life. “Bangladesh has a tradition in producing mango. So we went into mango pulping to making mango juice,” he explains the beginning of Pran Agro Ltd. The Pran Agro industrial park situated on 92 bigha (0.3306 acre) land has 12 production lines which includes — sauce/ketchup, pulping, chutney, pickles, jam/jelly, different kinds of candy, laccha shemai, snacks, spices and plastics. In the pulping section 750 metric tonnes of mangoes can be crushed per day. “This year our management gave us the target of 30,000 metric tonnes of pulp and for that we need to buy 60,000 metric tonnes of mango,” informs the factory general manager Manzurul. As soon as the factory gate opens, vans carrying baskets of mangoes enter the factory, either from the suppliers' sheds or from purchasing centres. The baskets are checked and weighed to see whether the mangoes meet the quality parameters. “Our suppliers are all enlisted and they know our quality parameters. For example a single mango has to be minimum 70 gram, neither too ripe nor green,” informs Manzurl. From the factory shed, the mangoes go to the aam bachai workers, from there to the conveyor belts into the crushing machine. By that time the mangoes have been checked for their freshness six times. “At the machine, the skin and the seed get separated, the pulp enters a refinery where the fibre and black particles are filtered out. Then the pulp is pasteurised and through a machine and collected into a drum. 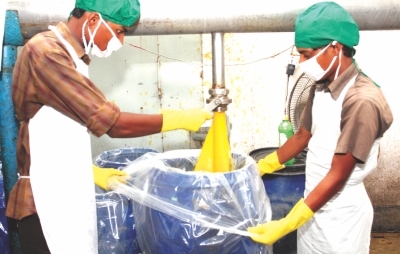 The drums are then sent to cold storage,” explains Mohammad Hefzal Hossain, Deputy Manager, Plant. According to Manzurul, one of the main problems at the factory is the high utility cost. The factory has to use furnace oil instead of gas thus increasing the production of one kg of steam from 24 paisa to Tk 2. Yet instead of Ghorashal and Narshingdi where Pran's other processing units are situated, Natore has been chosen for agro production, for two reasons. One — it is the main entry point to North Bengal easily accessible from all the other northern districts and secondly, mango, being a perishable item, has higher chance of going bad when taken to Dhaka. The pulp is collected in drums to be sent to cold storage or the juice drink processing unit. However, Amjad Khan Chowdhury finds bad management and long gestation period as the major constraints in setting up and running a business in Bangladesh. 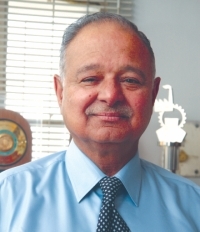 “Our main problem is the society's management –whether it is in government, press, my business or schools — anywhere the management is atrocious in the society,” opines Chowdhury. He believes that resources like oil and money can flow in but effective leadership, entrepreneurship and management is what we lack. “We are all first generation industrial employees and there is no management culture,” he adds. Referring to our poor educational quality, he says that the quality of human resources and putting them together for collective performance is the major constraint faced by industrialists. Yet the visionary moves forward with his future plans of investing in the dairy sector. “It helps in nutrition, bio-gas, organic fertiliser, hides and skin. It is my passion and the last innings of my life,” informs Chowdhury with a beaming smile. With Amjad's vision, soon someone like Sabina or Chameli in another part of Bangladesh may find their hands useful and save themselves from the clutches of poverty.